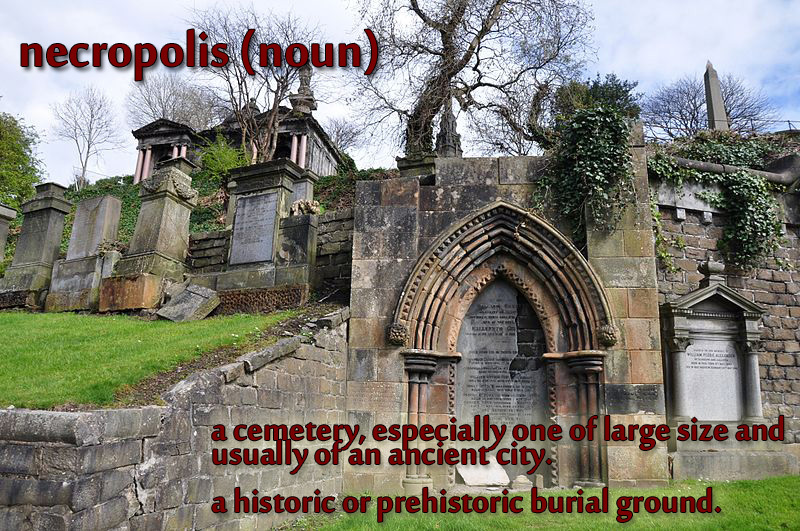 A necropolis is a final resting place for the bodies of those who have passed. As I discussed in mausoleum and charnel house, where to place the dead changes across time and culture. Such places hold deep meaning, and some become a pilgrimage. Droves of fans visit the graves of James Dean, Marilyn Monroe, and other icons. The devoted visit the bones of saints. Houndsditch was … a crumbling and smoke-grimed necropolis in boarded windows, mummified everywhere by old railings, stagnant air , and cobwebs, where draughty hallways reek with the smell of stale cabbage, Blakean children weep soot, and merchants patter with Mammon and make God evanescent. We have an uneasy relationship with the dead. We give them a proper place of rest that we can visit but that is cloistered. Certainly, hygienic reasons for this intermingle with superstition and a desire not to be reminded of our own mortality and loss. His chamber is the silent halls of death. Death is inevitable, so let’s think of it as an awakening as opposed to a going to sleep. The reality of dying is a reason to breathe life into each day we walk this earth.